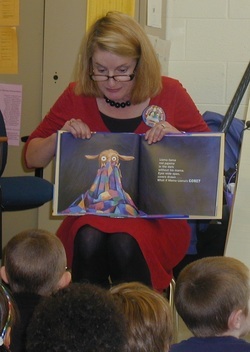 December's Book, by Caralyn Buehner, illustrated by Mark Buehner! Have you ever built a snowman and the next day discovered that it looks different? The smile seemed different, the nose drooped, perhaps the arms hung down like they were tired? Have you wondered what snowmen do all night long when no one is watching them? 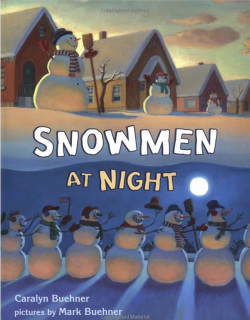 In this fun book a young boy notices that his snowman has gotten droopy and disheveled and his imagination soon takes us on a nocturnal adventure with all the neighborhood's snowmen. The rhythm of the rhyming text tries to match the rollicking spirit of the snowmen's wintry pursuits making it easy to get into the "swing" of the story. You and the kids will enjoy the illustrations that cleverly depict the nighttime scenes and the coming of the new day. Watch for subtle images in the clouds, snow, and even the moon. If we don't have enough snow for you and your children to build a snowman you might want to buy some styrofoam balls of varying sizes using tooth picks to stack them into snowmen. You could then dress them with little scarves and hats and draw faces on them with felt tip pens. See December's News Letter by clicking here. Created and produced by the Youth, Education and Family Services Office, Healthy Families Partnership in Hampton. See the other books that have been read by Book Club volunteers as a part of the Mayors' Book Club. Visit your local schools - the teachers are working hard and appreciate your visits. Click here if you would like to sign up to be a Mayors' Book Club Reader in Hampton ! 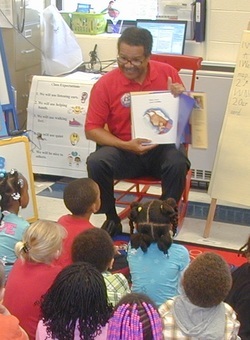 Click here if you would like to sign up to be a Mayors' Book Club Reader in Newport News ! Not only do the Mayors read each month - but also judges ; active and retired military (Army, Navy, Air Force, Marines, and Coast Guard); Kiwanians; police; fire fighters; civil service members, retired folks; high school and college students; school board members; clergy; farmers; doctors; homemakers; Dads, Moms, & grandparents; white collar, blue collar and no collar workers; sea captains; tug boat operators; fishermen; oystermen; contractors; politicians and attorneys.